Storage bridges come in many varieties within the internal and external market segments. On the external side, they usually have one or more downstream SATA ports. The most popular uplink port is some sort of USB connection. eSATA as an uplink interface is on the way out. High-end products have Thunderbolt support. Within the USB storage bridge market, device vendors have multiple opportunities to tune their product design for specific use-cases. Today's review will take a look at the StarTech.com S251BU31C3CB and the Satechi B01FWT2N3K. Both of them are USB 3.1 Gen 2 Type-C enclosures for 2.5" SATA drives with a metallic exterior. There are some subtle differences between the two - the StarTech.com unit has the Type-C cable integrated, and the chassis is designed to be able to stow away that cable for easy portability. The Satechi unit has a Type-C cable included in the package. Consumers interested in the aesthetics aspects might also find the Satechi unit attractive, as it comes in three different colors - Space Gray, Gold and Silver. Both the units come with a screwdriver and appropriate screws. The StarTech.com unit has screw mounts for the 2.5" drive to the internal plastic bay, and the bay to the metal chassis. The Satechi unit has screw mounts only for the bay to the metal chassis (and it comes pre-installed, as can be seen in the above gallery). The pictures in the gallery also show that the StarTech.com unit uses the ASMedia ASM1351 bridge chip, while the Satechi unit uses the VIA Labs VL716 bridge chip. Our evaluation routine for storage bridges borrows heavily from the testing methodology for direct-attached storage devices. The testbed hardware is reused. CrystalDiskMark is used for a quick overview, as it helps determine availability of UASP support and provides some performance numbers under ideal scenarios. 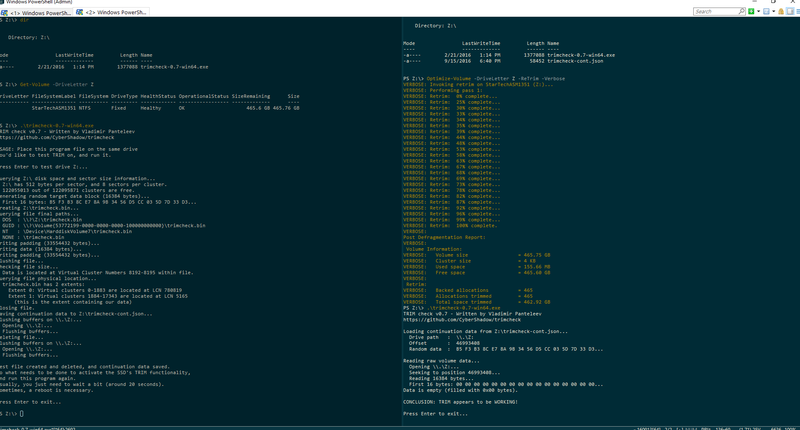 Real-world performance testing is done with our custom test suite involving robocopy bencharks and PCMark 8's storage bench. We use the Crucial MX200 500GB SSD as the storage drive for all the bridges / enclosures that we are evaluating as part of this review series. 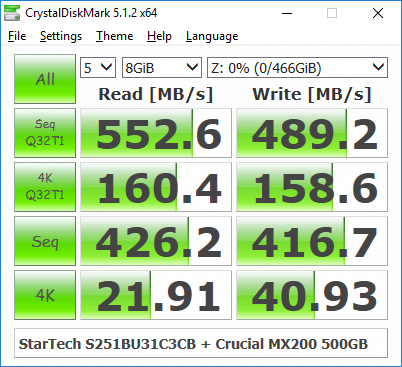 Comparing the '4K Q32T1' and '4K' numbers can quickly tell us whether the storage device supports NCQ (native command queuing) / UASP (USB-attached SCSI protocol). If the numbers for the two access traces are in the same ballpark, NCQ / UASP is not supported. This assumes that the host port / drivers on the PC support UASP. We can see that the NCQ/UASP is supported by both enclosures as the 4KQ32T1 numbers are more than 8x and 3x of the 4KQ1 read and write numbers respectively. The test starts off with the Photos folder in a RAM drive in the testbed. robocopy is used with default arguments to mirror it onto the storage drive under test. The content on the RAM drive is then deleted. robocopy is again used to transfer the content, but, from the storage drive under test to the RAM drive. The first segment gives the write speed, while the second one gives the read speed for the storage device. The segments end with the purge of the contents from the storage device. This process is repeated thrice and the average of all the runs is recorded as the performance number. The same procedure is adopted for the Videos and the BR folders. Usually, PC Mark 8 reports time to complete the trace, but the detailed log report has the read and write bandwidth figures which we present in our performance tables. Note that the bandwidth number reported in the results don't involve idle time compression. Results might appear low, but that is part of the workload characteristic. Note that the same CPU is being used for all configurations. Therefore, comparing the numbers for each trace should be possible across different DAS units. 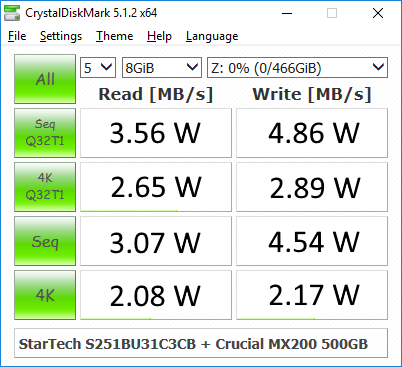 The StarTech.com unit and the Satechi unit perform very similarly in almost all the benchmarks. 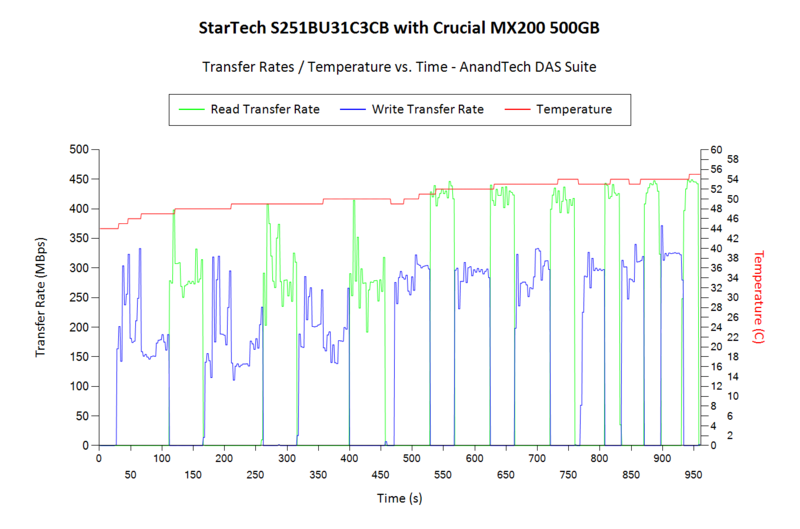 There are a few traces for which the Satechi performs better, but the StarTech.com unit also has an equal number of access traces for which its performance comes out on top. 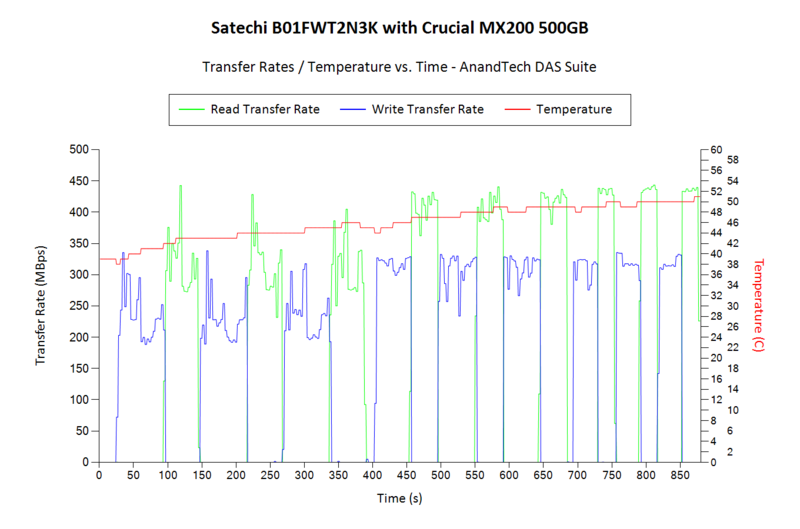 The thermal design of external storage enclosures has now come into focus, as high-speed SSDs and interfaces such as USB 3.1 Gen 2 can easily drive up temperatures. This aspect is an important one, as the last thing that users want to see when copying over, say, 100 GB of data to the drive inside the enclosure, is the transfer rate going to USB 2.0 speeds. In order to identify the effectiveness with which the enclosure can take away heat from the internal drive, we instrumented our robocopy DAS benchmark suite to record various parameters while the robocopy process took place in the background. Internal temperatures can only be gathered for enclosures that support S.M.A.R.T passthrough. Readers can click on the graphs below to view the full-sized version. Between the two enclosure, we find the Satechi one ended up with the SSD at 51C, while the StarTech.com one ended up with the SSD at 55C. That said, there is no issue with overheating or performance consistency in both enclosures. It is challenging to isolate the power consumption of the storage bridge alone while treating the unit as a black box. 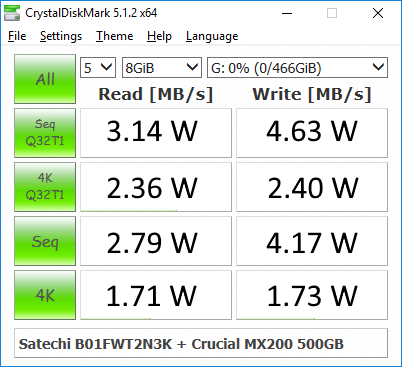 In order to study this aspect in a comparative manner, we use the same SSDs (Curcial MX200 500GB) in the units and process the same workloads on them (CrystalDiskMark 5.1.2's benchmark traces with a region size of 8GB and the number of repetitions set to 5). Plugable's USBC-TKEY power delivery sniffer was placed between the host PC and the storage bridge to record the power consumption. The average power consumption for each access trace was recorded. The pictures below present the numbers in a compact and easy to compare manner. Any difference in power consumption for the same access trace between two different units is down to the storage bridge itself (since the drive used is the same in all cases). As we could guess from the temperatre graphs, the StarTech.com unit / ASMedia ASM1351 bridge consumes slightly more power compared to the Satechi unit / VIA Labs VL716 bridge. The Satechi unit / VIA Labs VL716 bridge chip has no trouble supporting TRIM for SSDs connected to it. We repeated the same test with the StarTech.com enclosures. The StarTech.com unit / ASMedia ASM1351 bridge chip has no trouble supporting TRIM. However, we must mention here that we are using a review unit from the latest production batch that has a newer firmware. StarTech.com will be hosting the firmware update for older units on their poduct support page soon. Coming to the business end of the review, we find that the StarTech.com unit as well as the Satechi unit target slightly different customers. With the choice of colors, the Satechi unit might find wider acceptance with the average consumer. On the other hand, the StarTech.com unit with an integrated cable and a stowing mechanism allows for a more compact and portable unit. The possibility of a missing cable to connect to the PC doesn't arise. However, it also means that users will need an adapter to use with older systems that have only Type-A ports. For use-cases involving 2.5" hard drives, I would recommend the StarTech unit more because of the extra screws to keep the hard drive mounted to the plastic bay that slides out. The Satechi unit just relies on an elastic pad at the end opposite to the SATA port. Vibration handling could be an issue since the drive might not be mounted snugly in that case. 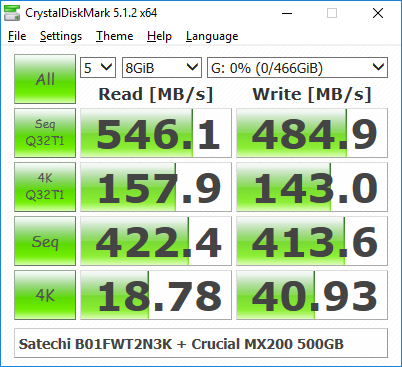 However, this is not an issue for SSDs at all. Based on our measurements with power consumption for various access traces, the VIA Labs bridge chip appears to be more power efficient compared to the ASMedia one. For use-cases involving notebooks and other battery systems, the Satechi unit with the VIA Labs bridge chip might be preferable. Both the Satechi and StarTech.com units perform in a similar manner and there is not much difference in the price. We have no hesitation in recommending either unit for purchase, and the reader can opt for the one most relevant to the use-case. Benson doesn't go back and update his reviews after he makes them. The number and quality of the available cables has expanded significantly since his initial reviews. Having just went through the HUGE hassle of trying to find USB-C cables that support 3.1 I can say there are cables that numerous cables that support 3.0 and 2.0 bandwidth over a USB-C connection,in fact most of the USB-C male / USB-A Male cables support USB-2.0 but there are several that support 3.0. The trouble is finding a cable that actually supports 3.1 with more than 500ma capability, those are unicorns right now. There are more than a hundred USB-C cables and iirc I was only able to find 2 brands that supported 3.1 with the capability of more than 500ma power transfer and both were 3' cables. The poster was probably referring to performance. If you're going to use mechanical storage (there aren't any 3.5 inch ssds) there's no point in a usb 3.1 gen2 enclosure, "gen1" (which is just usb 3.0 with a different connector really) is more than enough - and those are cheaper. The 10 TB HE10 SATA sustains above 200 MB/sec through 2/5 of its LBA. Assuming that being SATA makes it all outside the enterprise niche, which it doesn't really. But even then, even USB 3.0 is plenty in terms of bandwidth. Even two drives in parallel won't saturate it.